Melina Place which is a short street running westwards off Grove End Road, has had a mixed history of residents. As the suburb grew it acquired a rather louche reputation : high walls and covert relationships being natural partners. But high walls and sedate calm also attracted all kinds of institution designed to provide – at a cost lower than was possible in the central districts , but still accessible to wealthy friends and benefactors – a home for those who, for one reason or another, might be thought able to benefit from quiet and seclusion. Some of these were on a very small scale. To take some little known examples, : by 1830 one of the capitals most select private asylums for psychriatic patients was established in Melina Place. In the early nineteenth century it was associated with a superintendent licensed for the reception of lunatics by the Metropolitan Commissioners in Lunacy for 1831-32 with five patients. A private mental asylum was already established as early as 1830. At that time it was regarded as one of the capital’s most select private asylums for psychiatric patients. Moving on during the century the inhabitants belonged to the artistic world, like Gorge Colman the Younger (1762-1836) who was a theatrical manager and who lived at no.4 in 1811 and at no. 5 in 1824. Dr William Farr, an epidemiologist, lived in the Place from 1846-60 and was the physician to Florence Nightingale. He died in 1883. Arnold Toynbee CH ( 1889-1975 ), the British historian, lived at no.3. Phil May (1869-1903) the caricaturist, lived and died at no.5. (now 5a). In 1885 this was a stable which was converted. 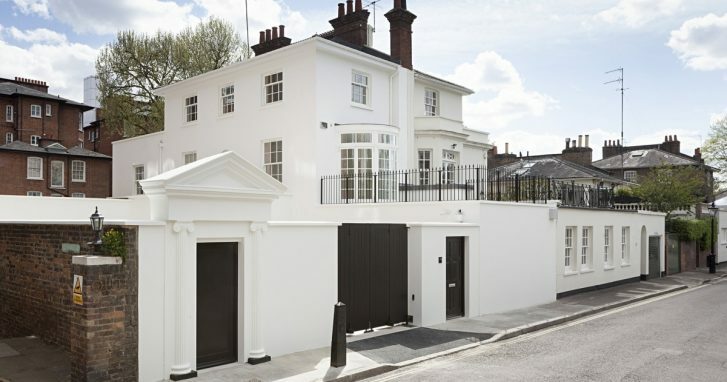 No.6 (now no.6a) was the home of Henry Macbeth- Raeburn RA (1860-1947) , the Scottish painter and printmaker, who applied for an extension to his property in ???? Thomas Henry Huxley PC PRS FLS FRS ( 1825 – 1895) was an eminent biologist specialising in comparative anatomy.. He was known as ‘Darwin’s Bulldog’ for his advocacy of Darwin’s theory of evolution. He lived at no. 11. A descendant of his is Sir Crispin Tickell, the British diplomat, environmentalist and academic who for a while lived in Alma Square. Nos 9, 10, and 11 were also occupied by artists and architects. Arthur Machen (1863-1947), the Welsh author and mystic, lived at no.12 from where he entertained such friends as Augustus John, Wyndham Lewis and Jerome K Jerome. Other artists living at no.12 included Allen C Sealy (1850-1927), a painter of race horses , who moved there in 1881 and in 1885 made a request for an extension to his house. Alfred and Rosalie Emslie and Frank Ogilvie were other artists at this address. This page was added on 11/07/2018.